First of all, we promise you will never feel hungry in Mongolia during the travel with us. 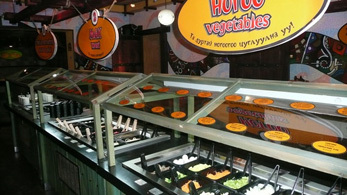 In Ulaanbaatar travellers have good choice to eat what kind of meals. In Ulaanbaatar there are many modern luxury restaurants: French, Italian, Czech, Mediterranian, Mexican, Japanese, Korean, Chinese, Russian, Indian and Mongolian restaurants, where is available to be served western and eastern standard meals or Mongolian traditional cuisines. The western standard meals feature eggs, vegetables, soup, fruit and milk products. For example: Omelets for breakfast; potato salad, mushroom soup, fried fish …... are for lunch; Greece salad, fried chicken, choco cake for your dinner. Travellers are served with 5 course meals. For example: Mozzerella cheese salat, mushroom soup, beaf steak, apple pie for desert and tea, coffee or mineral water. Also travellers have good time in cozy bars and beer pubs. 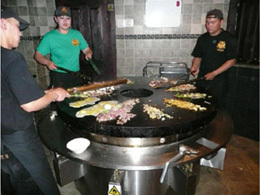 Also Mongolian Barbeque Buffet restaurants are open to travellers. Travellers stir from meat and vegetable for what to eat and the restaurant waitress will grill for only that person. This was originated from Mongolian hunters and ancient soldiers, who used to fry the meat of hunted animals on their shield in open fire. Mongolian cuisine consists of lots of beef and mutton. Tea or coffee served with meals. Alcoholic beverages are available at an additional charge. You will have only chance to taste Mongolian traditional cuisine-barbecue in countryside. Also when you visit to Mongolian nomads house –ger, you will be served with the milk products such as mare's fermented milk, yogurt, and milk crème butter… For the first time try it is advised to drink little. When you stay in Ger camps in countryside, western styled meals will be served and but there are not many choices as like as ice creams or fresh fruit for decert due to their remote location. For example:You can have cabbage salad, potato soup, fried chicken and fruit cocktail. If you want, our guides can order you some Mongolian meals like Mongolian BBQ, beef dumpling, noodle soup and so on…. During stay in tent camping, our field cook will prepare the 5 course meals for you. If you have special diet or you are vegeterian, it can be arranged in your trip with our pleasure. Also it is available to have and taste hand-made diary products such as yogourt from cow milk, cheese from yak milk, traditional tea - tea with cow milk, national beer- fermented mare’s milk, dried milk curds, fried curds, butter cream, even vodka from cow milk. In Mongolia, water quality is good. You can find bottles of mineral water, water with vitamin, soda like coke, fanta, fruit juices, beers in supermarkets and tourist camp buffets. Mineral water is usually included in our offers. But alcoholic drinks is not provided on the trips.